In any salon, the customers notice not only the cleanliness of the salon but also the staff uniforms. To maintain your impression on your clients, Salonwear offers you one of its top quality products, the snap coat. If you’re looking for apparel and accessories for your salon or spa that not only look sophisticated but also are functional, then you’ve come to the right place! Apart from snap coats, you can also upgrade your salon by purchasing other salon uniforms for your beauticians that we offer, such as the salon capes, short jackets, snap jackets, stylist jackets, salon jackets, cutting capes for barber, client gowns, smocks aprons, body wraps for your spa, combination capes, super coats, zip smocks, caftans, tunic tops, sleeveless vests, best robes for spa, terry headbands, twist wrap for wet hair, hair stylist jackets, personalized barber jackets, spa coats, salon coats, stylist coats, hairdresser coats, beautician coats and many more! Your staff members can easily give hair, facial and body treatments to the customers without damaging the clothes. Apart from snap coats, we also offer other kinds of designer jackets: V neck coats, swing coats, super coats, and barber jackets. 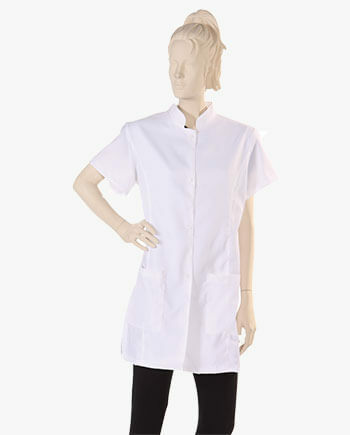 The snap coat offered by Salonwear is made of polyester fabric which makes it a nice salon coat. This fabric is easy to maintain and machine wash. Polyester also resists wrinkles and shrinking. Your staff members can work for long durations wearing the same snap coat easily. This makes a perfect hairdresser coat for your employees. The snap coat offered by Salonwear comes with four snap buttons in the front of the jacket. This allows you to wear and remove the coat without any hassle. 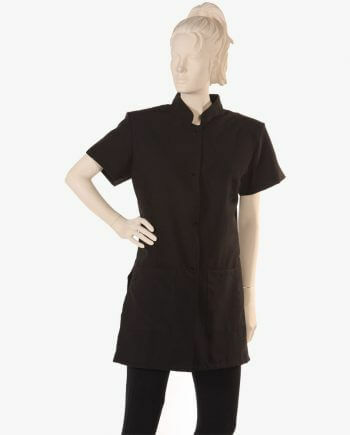 This thigh length snap coat is ideal for use in almost all types of scenarios in a salon. European collar, straight bottom, short sleeves and shoulder pads add to the quality and appearance of the product. The snap coat is available is many sizes: x-small, small, medium and large. At Salonwear, this product is available in black and white colors. Both colors look elegant and professional. Apart from the wide range of spa and salon apparel and accessories that we offer, we also offer two unique customization services: screen printing and embroidery – on almost all beauty salon smocks. You can personalize your salon coat with your spa or salon’s logo and also other apparel and accessories. Stocking such customized snap coats is sure to impress your clients. Salonwear is a family business and the market leader in the salon and spa apparel and accessories industry in the US since the past 31 years. Our experience and expertise in this industry has helped us earn the name of a trustworthy brand. With our knowledge of this market, we are constantly adapting to the changing trends in the market. With our hard work and excellent customer service, we have retained a large and happy pool of loyal and satisfied clients.